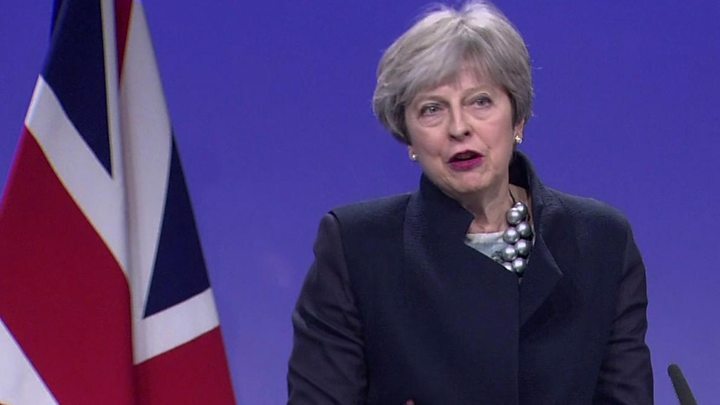 The prime minister said talks would reconvene “before the end of the week” and she was “confident we will conclude this positively”. 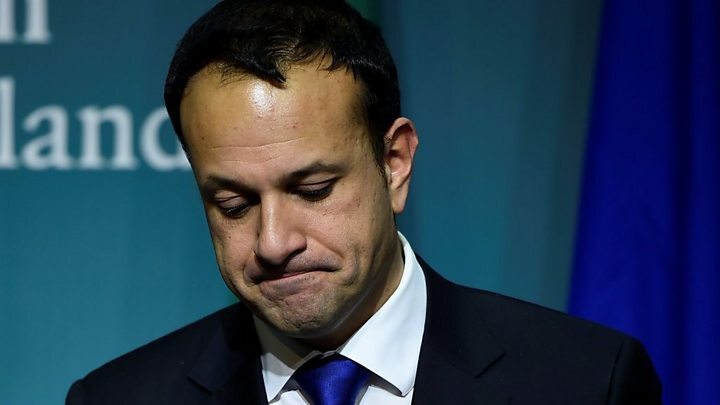 “I am surprised and disappointed that the British government now appears not to be in a position to conclude what was agreed earlier today,” he told a press conference in Dublin. BBC political editor Laura Kuenssberg said: “Is it a complete disaster? No. Does it mean this whole process is totally doomed? No, it does not. Is it a pretty significant disappointment? Yes, it is. Northern Ireland’s DUP has 10 MPs at Westminster, and their support is vital to the government. This is because the Conservatives are without a Commons majority since June’s general election, and rely on a deal with the DUP to ensure they can survive key votes. The UK had reportedly been prepared to accept that Northern Ireland may remain in the EU’s customs union and single market in all but name. But Mrs Foster then said her party “will not accept any form of regulatory divergence” that separates Northern Ireland from the rest of the UK. “During the call it was made plain to the PM that the DUP had significant concerns about the deal being discussed that gave concessions to the Dublin government,” said the BBC’s political editor Laura Kuenssberg. “I understand Mrs Foster told Theresa May that she would not be able to support such a deal. 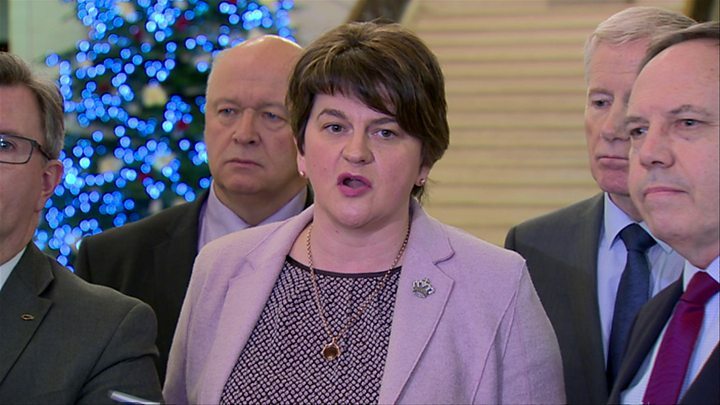 DUP leader Arlene Foster said her party would not accept any Brexit deal that “separates” Northern Ireland from the rest of the UK. Her party’s Brexit spokesman Sammy Wilson claimed Brussels has been trying to “bounce the prime minister into acceding to the shape of a deal they want” and many of her own backbenchers would not accept it. He said the DUP objected to the form of words used in a draft document, which he said referred to “regulatory alignment” and “no regulatory divergence” between Northern Ireland and the EU. Both phrases were “simply EU speak for keeping Northern Ireland in the European market” and “in effect, part of the United Kingdom would be kept within the single market,” he said. Asked if the DUP would pull out of the confidence and supply agreement they have with the Conservative government in Westminster over this issue, he said: “I think that her (Theresa May) problem isn’t going to be just with the DUP”. Leo Varadkar says he wants a written guarantee that there will be no return to a “hard border” between the Republic and Northern Ireland – and this is what he thought he had got. “I am surprised and disappointed that the British government now appears not to be in a position to conclude what was agreed earlier today,” he said. “I accept that the prime minister has asked for more time and I know that she faces many challenges, and I acknowledge that she is negotiating in good faith. “But my position and that of the Irish government is unequivocal: Ireland wants to proceed to phase two. He said it was important to listen to the DUP, but also to bear in mind the position of other parties in Northern Ireland – and it should not be forgotten that the majority in Northern Ireland voted to remain in the EU. Speaking at a joint press conference in Brussels with Mr Juncker, Mrs May said: “We have been negotiating hard. And a lot of progress has been made. And on many of the issues there is a common understanding. “And it is clear, crucially, that we want to move forward together. 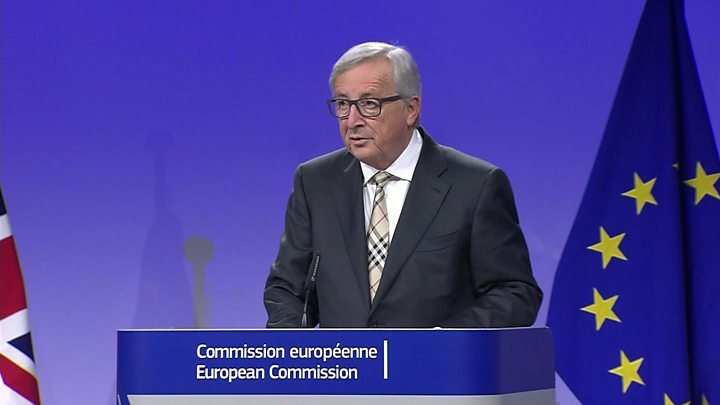 The European Commission President said “it was not possible to reach complete agreement today” despite their “best efforts”. But he added: “I have to say that we were narrowing our positions to a huge extent today, thanks to the British prime minister, thanks to the willingness of the European Commission to have a fair deal with Britain. “I’m still confident that we can reach sufficient progress before the European Council of 15 December. “This is not a failure, this is the start of the very last round. He added that “Labour has been clear from the outset that we need a jobs-first Brexit deal that works for the whole of the United Kingdom”. Leading Brexiteer Jacob Rees-Mogg said that the Conservatives were “as one” with the DUP on the importance of keeping the United Kingdom together, and the mood among Tory MPs in the meeting was “contented, not divisive or unhappy”. Backbench Remain supporter Anna Soubry said no Conservative MP wanted Northern Ireland treated differently from the rest of the UK, which she said would be “a gift” to the Scottish National Party. The “simple solution” would be for the whole of the UK to remain in the single market and customs union, she added. Scottish First Minister Nicola Sturgeon said that if Northern Ireland was allowed to operate under different rules there was “surely no good practical reason” why other parts of the UK could not do the same – a message echoed by Welsh First Minister Carwyn Jones and London Mayor Sadiq Khan. The UK has been set a deadline of this week to come forward with an improved offer on them, and hopes that the go-ahead for future talks will then be given at an EU leaders’ summit on 14-15 December. Those making a first time application for the right to stay after Brexit, however, will face a charge – reportedly similar to the cost of applying for a passport.